The fastest and easiest way to make a large batch of perfect crispy bacon? Use your oven! Bonus: clean-up is a snap. Preheat the oven to 400 degrees F. Line two rimmed baking sheets with foil. 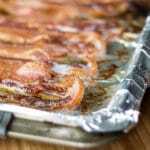 Place the bacon on the foil-lined baking sheets in a single layer. Bake at 400 degrees for about 20 minutes, or until bacon is crispy. Drain on a paper towel-lined plate and serve.